JRV Home Inspection Services is among an exclusive group of home inspection companies that is able to provide infrared thermal imaging. 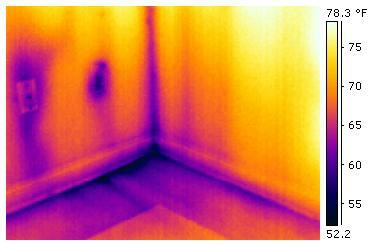 Thermography is a state of the art home and building diagnostic tool capable of locating problems within the building envelope quickly and non-destructively. Because infrared thermal imaging is a non-invasive inspection technique less destruction of materials occurs when locating and repairing problems. It may be compared to a surgeon using X-rays before surgery to locate exactly where he needs to cut. Infrared thermal imaging can be used to quickly and precisely locate problems such as heating and energy loss, the source of a water incursion or electrical issues. 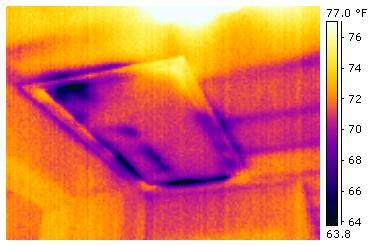 JRV Home Inspection Services uses FLIR thermal imaging cameras for all infrared assessments. FLIR is a leader in infrared technology, supplying the United States Government and industry world wide with infrared thermal imaging cameras. All infrared training by JRV Home Inspection Services was completed at FLIRs’ new state of the art Infrared Training Center (ITC) in Billerica, MA. 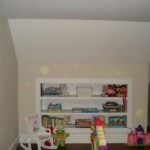 Equally as important is our experience as home inspectors. A skilled thermographer without knowledge of home and building systems lacks the essential background to thoroughly inspect and diagnosis problems discovered using infrared. should help gain some understanding of the subject. Thermal, or infrared energy, is light that is not visible because its wavelength is too long to be detected by the human eye; it’s the part of the electromagnetic spectrum that we perceive as heat. All surfaces radiate invisible heat energy. You’ve felt this energy emitted by the sun or a stove burner. Infrared cameras are specially-designed electronic devices that detect thermal radiation. They convert this radiation into thermal images, or thermograms. Infrared cameras do not “see” through or into objects, but detect extremely subtle external temperature variations which are captured and displayed by the camera and viewed and interpreted by the thermographer. 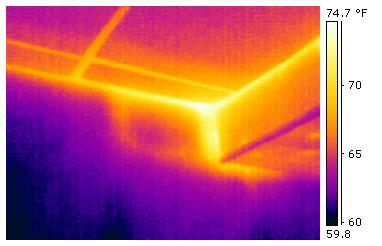 Today infrared thermography is becoming a more common place tool for building diagnostics. The reason for this is not that infrared is a new technology, it has been around for decades, but until recently the equipment has been prohibitively expensive and cumbersome to operate. Newer cameras are compact and less expensive than in the past, although they are still many thousands of dollars. 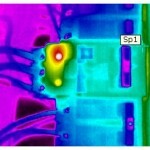 One service where infrared excels is energy auditing. 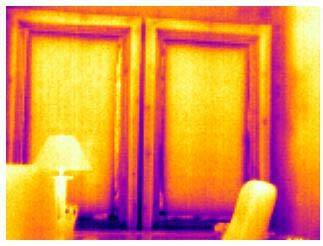 Because infrared cameras are heat sensitive, their use for locating heat and energy loss in buildings is a natural fit. Infrared provides a more precise, quicker visual detection of the areas of energy loss in a home or building over more traditional methods such as blower doors and smoke pencils. Missing or incorrectly installed insulation, air gaps in the building shell, and heating loss can all be quickly detected without any invasive techniques. The building performance deficiencies below are from actual clients’ homes. Most of these defects would not have been discovered using older, more conventional energy inspection methods, such as a blower door fan and smoke pencil or duct blaster. 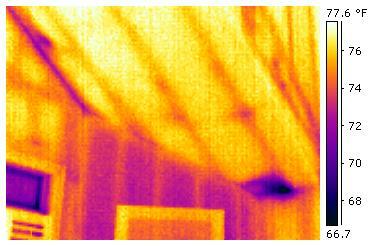 Keep in mind that an infrared scan of the home is not a full energy audit. 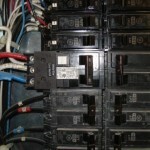 It is simply a tool used to gather information as part of the energy auditing process. 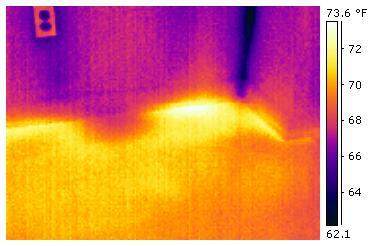 Above left: This thermogram shows missing insulation in an exterior bedroom wall. The homeowners hired an insulation company to fill the exterior wall cavities with blown in cellulose insulation. During the infrared inspection it was discovered several areas were either not filled or only partially full, as in the image above. 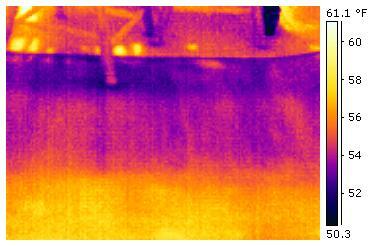 Above right: This image shows cold air infiltration along a wall base (the darker blue areas) and the radiant and conductive cooling effect to the floor and walls. Above left: Heating duct leakage inside ceiling and wall. This is a view from the finished basement ceiling of an uninsulated, unsealed heating duct. This duct was run inside a finished wall directly against an uninsulated exterior wall. The temperature at the heating register was approximately 20 º cooler than other registers in the home due to the ducts location and lack of insulation and sealing. This and the adjacent room, which was similarly deficient, were much cooler due to this problem. Above right: The same duct from above in the room where it supplies heat. 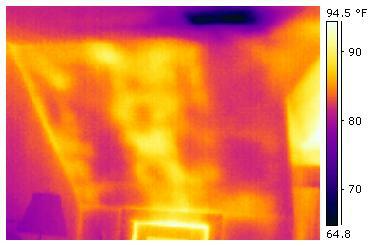 The heat leakage can be seen filtering through the wall base. Above left: Image is of a breakfast nook floor. Under this floor was a finished basement room that was unheated. The distinct line across the bottom of the picture is where the finished wall divides the room from the heated portion of the basement. It was also discover that the basement ceiling was uninsulated and cold air was strongly blowing in from the perimeter wall framing, thus causing the dramatic cooling seen on the floor. Above right: Attic access panel in a second floor hallway ceiling. The panel was partially insulated, but not weather stripped or sealed. The fiberglass ceiling insulation to the right of the panel (darker area) was compacted by use thus reducing its’ insulating capacity. Above left: This image was taken in the summer with the central A/C running. The duct is the dark blue spot at the top right in the picture. This wall in spite of what it may appear is insulated. This is very typical of the performance of fiberglass batt insulation. Because the insulation is forced into the cavity between the framing members, the paper vapor barrier creates cavities between the wall and it self. These cavities become airways allowing unconditioned air in between rendering the insulation basically useless. Above right: The wall section in the center of the image (purple) is an insulated 2 x 6 wall. Notice the wall studs are warmer than the wall. This shows that the wood is insulating better than the R – 19 fiberglass batt insulation. Wood has an R value of about 1.5 per inch. This means that the wall insulation is performing at less than R – 8!